Given that the dates of Western and Greek Orthodox Easter coincide in 2017 (specifically, 16 April), the highlight of this one-of-a-kind mainland trip will be spending Easter in Greece. But there’s much more to this program than just Easter. 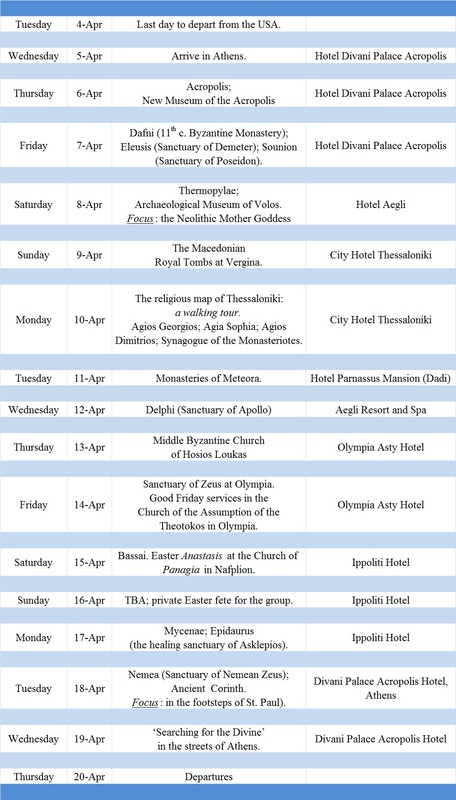 The itinerary will focus on the theme: ‘Searching for the Divine through the Ages’, a search that will provide a tantalizing mix of prehistoric, Greco-Roman, Byzantine, Greek Orthodox, Jewish, and Western Christian elements as we travel from Athens, to Volos, to Thessaloniki, to Amphikleia, to Arachova, to Olympia, to Nafplion, and back to Athens. We will first explore Athena’s city and then, over a period of 12 days, visit the 11th c. Byzantine Monastery at Dafni (now reopened), the Sanctuary of Demeter at Eleusis, the Sanctuary of Poseidon at Sounion, the Sanctuary of Nemesis at Rhamnous, the archaeological museum in Volos (with its unparalleled collection of Neolithic goddess figures), the Macedonian Royal Tombs at Vergina, the many churches of Thessaloniki, the Meteora Monasteries, the Middle Byzantine Church of Hosios Loukas, the Sanctuary of Apollo at Delphi, ancient Elis, the Sanctuary of Zeus at Olympia, the Temple of Apollo Epikourios at Bassai, the citadel of Mycenae, the Sanctuary of Asklepios at Epidaurus, the Sanctuary of Zeus at Nemea, and ancient Corinth, where we will follow in the footsteps of St, Paul. We will attend Good Friday services at the Church of the Assumption of the Theotokos in Olympia and celebrate the Easter Anastasis at the Church of Panagia in Nafplion. This is a spectacular agenda (the most ambitious and intriguing undertaking I’ve put together in 37 years of directing programs in Greece) as well as a unique and fascinating way to see a good portion of mainland Greece. As always, my partner will be George Spiridakis. George and I have worked together closely and inseparably for almost 30 years; he is without peer among Greek guides. George will also orchestrate our many private dining experiences. I have selected excellent hotels: all of them 4 and 5 stars, safe, comfortable, and well-located lodgings. We will limit the group to 12 persons so that we can utilize a 19-seater charter bus, avert audibility and visibility problems, and fit easily around a single table to enjoy at leisure the exquisite cuisine of Greece. Cost of the program: $5249.00 per person double occupancy (not including transatlantic air, trip insurance, passport fees, several lunches and a few dinners, and spending money). A single supplement will be based solely on the price difference between a single and per person twin hotel room at the time the reservations are paid. A $100 deposit will secure your registration. Disclaimer: Jean Holcomb Inc dba Viking Travel, George Spiridakis, W.J. McCoy, Ierapetra Express, and agents for the various companies, owners, or suppliers providing transportation, accommodation or other services. All tickets, coupons, and orders are subject to any and all terms and conditions under which services are offered or provided. The issuance and acceptance of such tickets, coupons, and orders, shall be deemed to be consent to the additional condition that Viking Travel and aforementioned companies and individuals, shall not be liable for injury, damage, loss, delay or irregularity howsoever caused by or arising out of any defect on any vehicle, or the default of any company, owner, or supplier of transportation, accommodation or other service.